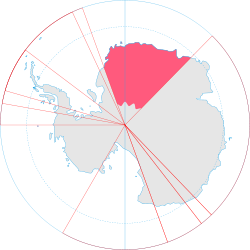 ↑ The Norwegian name, Dronning Maud Land, is also used by English speakers. This derives from a 1974 agreement between Norway and the United Kingdom, in which it was agreed to not translate the place names in each other's respective claims. Informal corresponding agreements is also in effect with Australia, New Zealand and France.